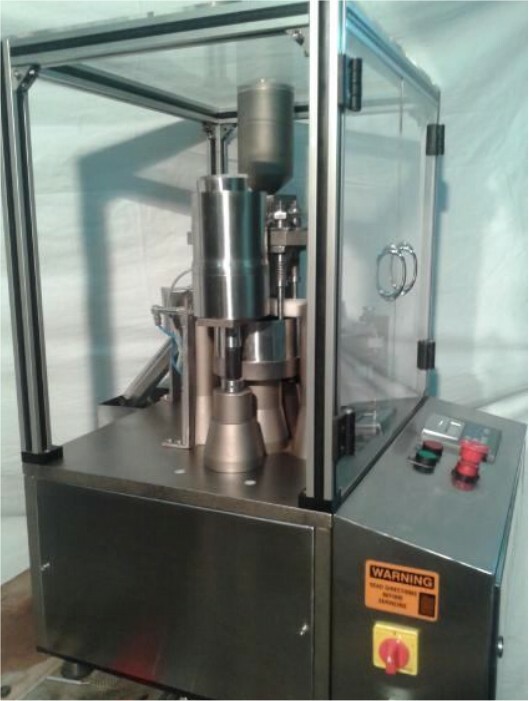 New Automatic Capsule filler GMP Model ACF-LAB-3000 consisting of conical hopper, powder filling system with stirrer mechanism, indexing principle, PLC controls panel, in-built vacuum pump. Provision for pellet filling,(additional parts required) tablet feeding system with extra optional attachments. Includes: 1. Set of powder change parts for Size “00”-“4”. (customer to specify) Output: 3000 per Hr. All powder contact parts shall be in SS304/SS316L material or as per industrial standards. Equipped with standard acrylic top hood and base SS covered. VFD for Main Motor. Air requirement: 10-12CFM at 6-8 bar, Dry Filter Air. Electrics: 1Ph/60Hz/230Volts(or specify). Floor Space: 700x650x950mm height, 250Kg. Delivery Timeframe: approx 10 Weeks from receipt of 65% Deposit.